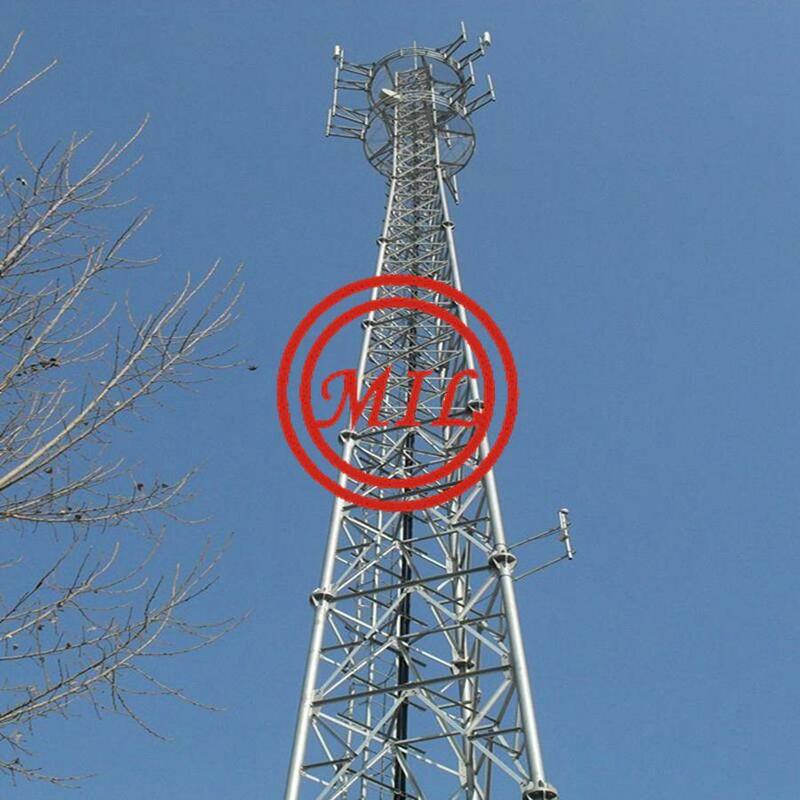 We offers a variety of Steel Pole types to meet your specific communication tower needs. Our Tapered Steel Poles and Flanged Steel Poles feature designs that are aesthetically pleasing and blend well into the environment while requiring minimum space for installation. All of our Steel Poles are hot-dip galvanized after fabrication to ensure years of corrosion free use. Tapered Steel Poles are designed with base diameters from 2' to 6'. These minimal site requirements lower lease rates and/or acquisition costs. Tapered Steel Poles are designed for rapid installation, making them ready for service quickly while meeting the demands of today's PCS, cellular, and other communication tower environments. We provide structure and foundation design services with approved engineering documents, in any state, by a registered professional engineer. Flanged Steel Poles are easy to handle and install. Precision fitted connections allow quick assembly of the modular sections and the top platform, sidearms or mounting frame. Our Steel Poles can be modified with an inside flange for better aesthetics. Internal Flanged Steel Poles are one continuous pole. Sections from 5' to 50' can easily be added should future expansion be required. Our broadband Light Duty Poles are a series of pre-engineered, light application poles. Light Duty Poles are designed for direct embedment at the base with a quick aggregate backfill. Poles are available in heights from 30 feet to 150 feet. ...and other lightweight communication pole applications. This specification covers three grades of seam-welded, round, tapered steel tubes for structural use. Grades A and B are of low-carbon steel or high-strength low-alloy steel composition and Grade C is of weather-resistance steel composition. 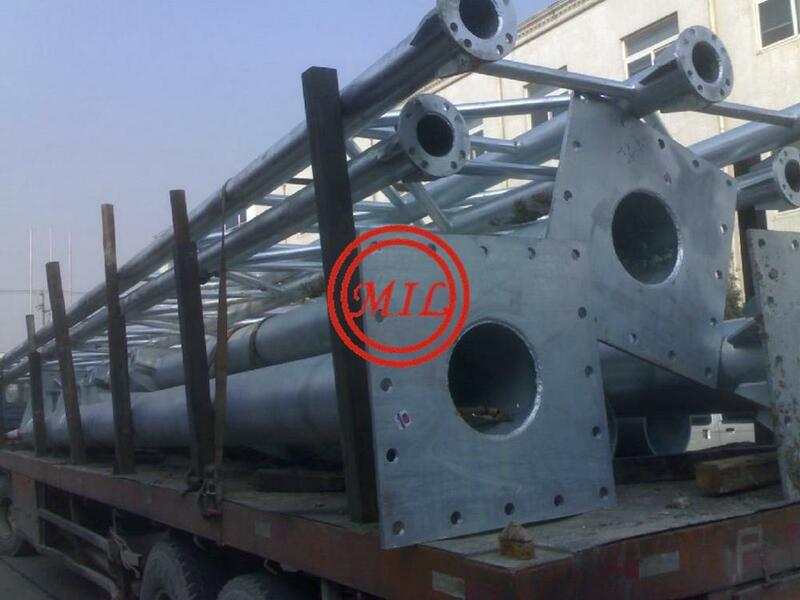 The tube steel shall be hot-rolled aluminum-semikilled or fine-grained killed sheet or plate manufactured by one or more of the following processes: open-hearth, basic-oxygen, or electric-furnace. The tubes shall be made from trapezoidal sheet or plate that is preformed and then seam welded. They shall be brought to final size and properties by roll compressing cold on a hardened mandrel. A tensile test shall be done to determine the yield strength and the ultimate tensile strength of the tubes. 1.2 This tubing is produced in welded sizes in a range of diameters from 2 3/8 to 30 in. [60 to 762 mm] inclusive. Wall thicknesses range from 0.1046 to 0.375 in. [2.66 to 9.53 mm]. Tapers are subject to agreement with the manufacturer. 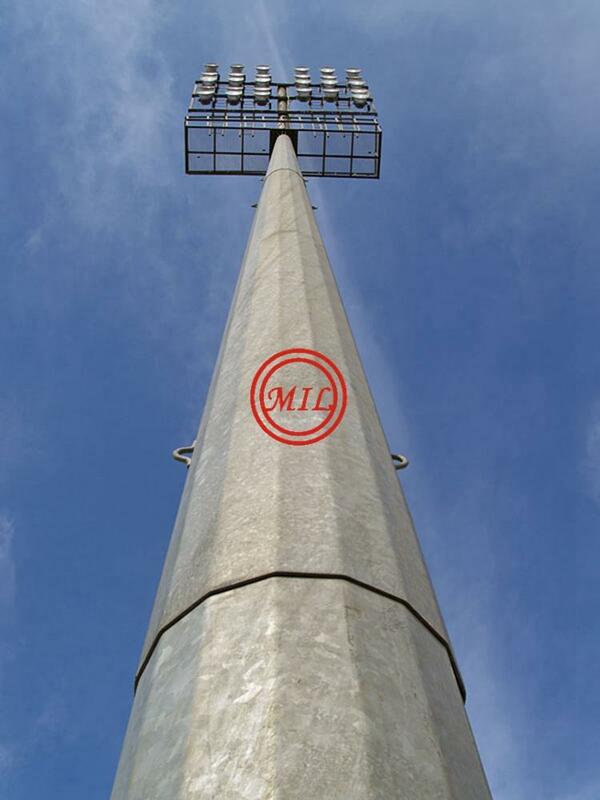 Lighting poles used in lighting main roads, streets, parks, gardens in compliance with TS 914-ISO 9002 standards. Lighting poles are coated by at least 70 -80 micron galvanic in the zinc bath by hot-dipping method. Traffic signboards and poles used as signboard poles in highways in the intended size with low cost without making concessions from quality. In general, the height of the poles manufactured as 3 mm, 4 mm and 5 mm in thickness are set according to length of the plate to be tied. The special structure of the poles hinders and fixes the plate rotate around its axis. Its life span is extended by coating galvanic by hot-dipping method. Furthermore, it is not required to make maintenance to the poles by means of hot-dipping galvanic method. Through the available holes in the poles, the required arrangements may be carried out and thus, it gets easy to tie the plates to the poles. Our power transmission line poles used in transmission and distribution lines in a way of overhead line are manufactured in compliance with TEDAŞ and TEİAŞ specifications and TIA/EIA – 222F standards. Power transmission line poles and distribution networks transmission lines manufactured as low, intermediate, high and ultra high voltage in line with demand are designed and manufactured by our company in compliance with national and international standards. i. ASTM A595 / A595M - 14 Standard Specification for Steel Tubes, Low-Carbon or High-Strength Low-Alloy, Tapered for Structural Use. 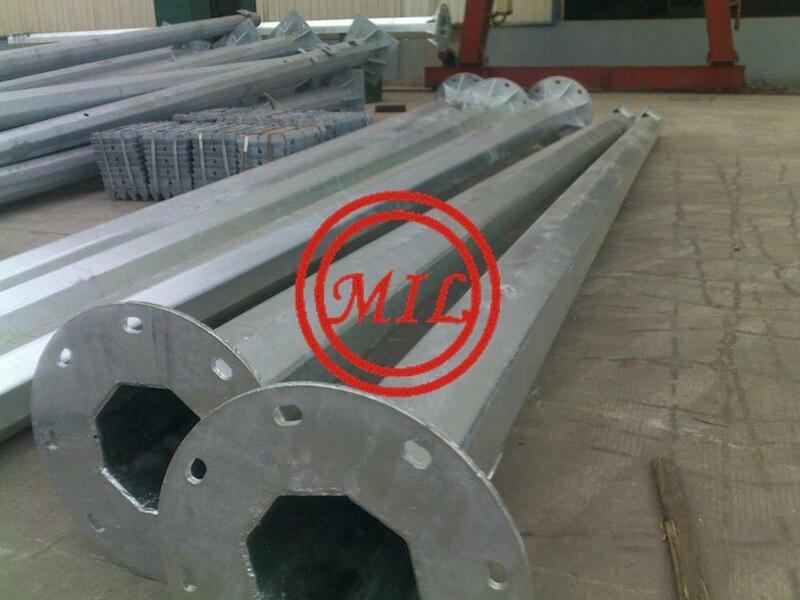 Steel shaft of the pole shall be fabricated from not less than #11 Manufacturer's Standard Gauge, best grade, hot rolled basic open hearth steel. 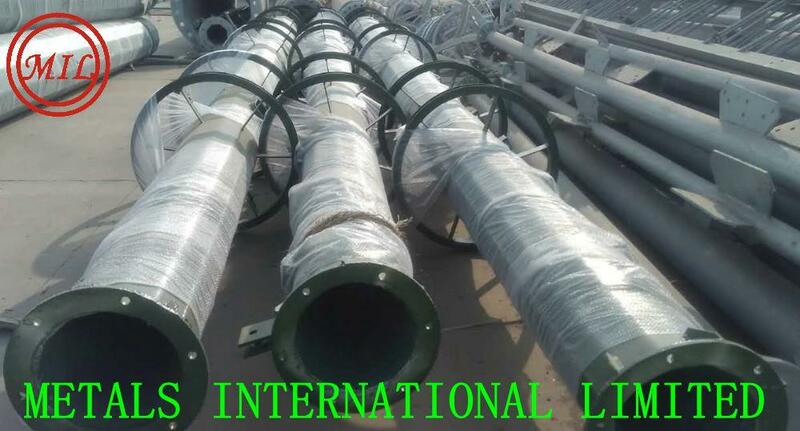 The shaft shall have only one longitudinal, automatically, electrically welded joint, and shall have no intermediate horizontal joints or welds. Only one length of steel sheet shall be used, which shall be formed into a continuously tapered shaft, having a taper of approximately .14” per foot. After forming and welding, the tapered shaft shall be longitudinally cold rolled under sufficient pressure to flatten the weld and increase the physical characteristics of the shaft so that the metal will have a minimum guaranteed yield strength of 55,000 psi. The cold rolling process shall also form a round, octaflute, square, octagonal, or cruciform shaft (as specified by the design of the pole to be furnished). The octaflute shaft shall have equally spaced Doric flutes, sharp and clear-cut throughout the entire length of the shaft. To obtain the sharp crest of the flutes, the radius of the crest shall be less than the thickness of the metal in the shaft. Intended Use: For City Streets, Parking Lots, Campuses, Commercial Developments, Plazas, Historic Districts, Village Squares, Residential Areas, Parks, Walkways, Boulevards, and Roadways. Features: Pole shaft is one piece, low carbon alloy steel per ASTM A595, Grade A with 55,00-PSI minimum yield strength. Pole base shall be per ASTM A36 and shall telescope pole shaft and be circumferentially welded top and bottom. Hand hole is 2” x 4” minimum, cover and fasteners are included. Base covers shall be two piece, interlocking construction. Finish shall match pole. Removable pole cap shall be provided with each drill pattern type pole. Non-structural fasteners shall be stainless steel. Features: Pole shaft is one piece, 6005, 6061, or 6063-aluminum alloy, heat-treated to a T6 temper. Pole base shall be 356 or A356 aluminum alloy, heat-treated to a T6 temper after welding. Hand hole is 2” x 4” minimum, cover and fasteners are included. Nut covers shall be provided as standard. Finish shall match pole. Removable pole cap shall be provided with each drill pattern type pole. Non-structural fasteners shall be stainless steel. A. 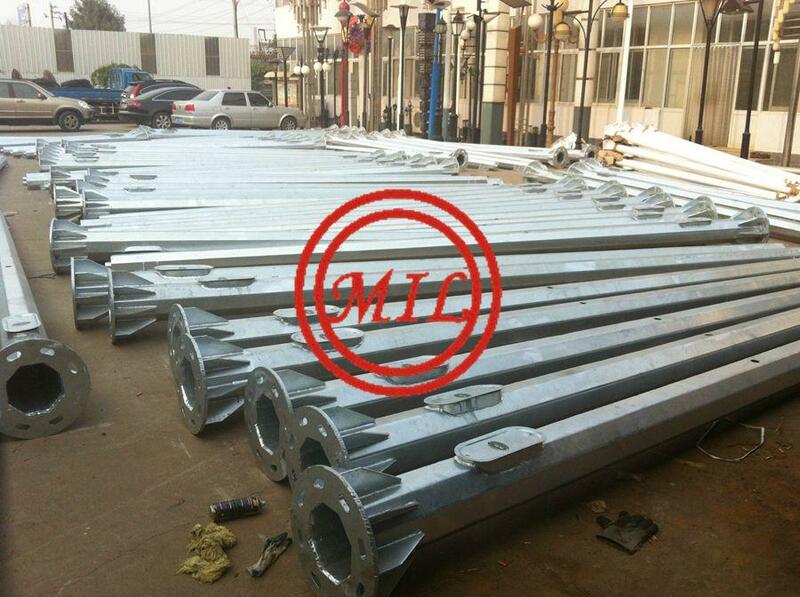 Steel traffic signal pole assemblies, including anchor bolts. 1. 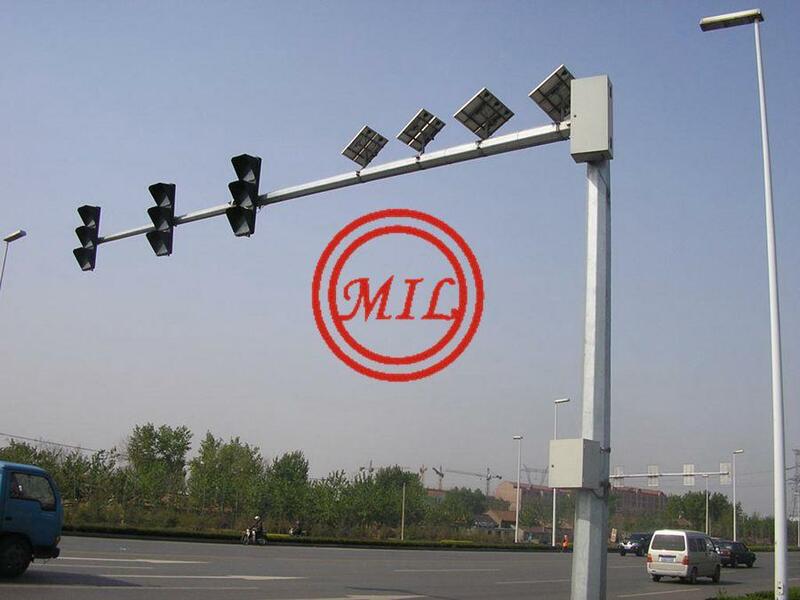 Payment for Traffic Signal Pole Assemblies will be measured by each traffic signal pole assembly. less than three (3) years. requirements for 90 mile per hour wind. D. Welds: All welds shall meet the requirements of AWS D1.1. referred to in this specification. loadings, when installed on the pole. shaft, having a taper of approximately 0.14 inch per foot. and be attached by means of two continuous welds, one on the inside of the base at the end of the shaft, the other on the outside at the top of base. The base plate shall be arranged to accept four (4) 2-1/4 inch diameter anchor bolts on an 18 inch bolt circle. inch - 13 UNC grounding provision. Dimensions shall be as shown on the detail drawings. E. Each pole shaft shall include a steel pole plate welded to shaft for the mast arm connection. the requirements of ASTM-A36 or ASTM A572 Grade 50 steel. G. The pole shaft shall be drilled in the field at required signal locations. and meet the requirements of ASTM-A325. shall be uniform at any cross-section and shall be reasonably straight. locations required. Refer to the standard drawings for tenon details. A. The luminaire arm shall be fabricated from 2-inch Schedule 80 pipe. accordance with details shown on the standard drawings. solutions by immersion in a circulating fresh water bath. remaining in the flux coat and/or trapped within the product.